Vegetables for sale at a market. 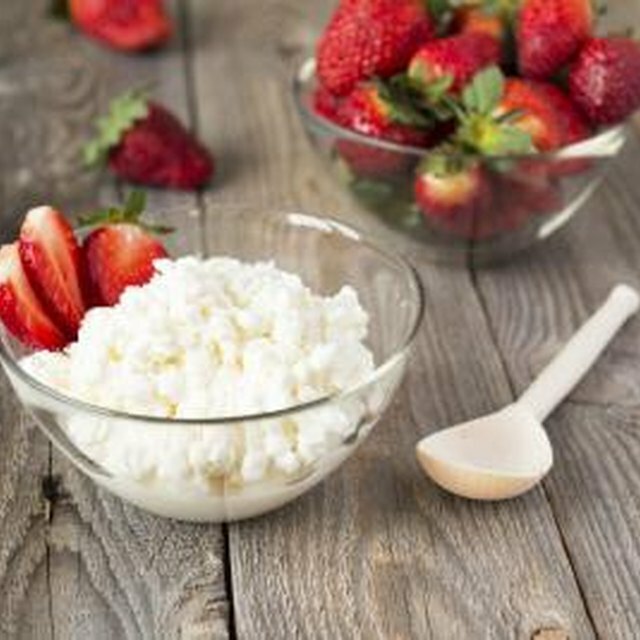 1 Is Cottage Cheese Healthy to Eat? 3 How Many Calories Does a Small Banana Have? Fruits and vegetables are one of your best weapons in the quest for flat abs. Of course, you also need to work out regularly, but incorporating fresh produce into your diet can get you on the fast track to a six-pack. Replacing a percentage of your regular foods with fruits and vegetables is the closest thing there is to a "magic pill" for weight loss, and it does wonderful things for your overall health as well. Two things are necessary for flat abs -- tight muscles and a low body fat percentage. The body fat "fitness" range is 21 to 24 percent for women and 14 to 17 percent for men (1). Regular workouts will give you the tight muscles as long as you do a core routine that works your abs from every angle, and cardio will help reduce your body fat. But no matter how many crunches you do or how many miles you run, you'll still have a stomach pooch unless you have a healthy diet. You must cut 500 calories from your daily diet to lose one pound per week. This seems impossible to many, but it is the equivalent of a soda and a candy bar -- not really so much. On the other hand, 500 calories is equal to five bananas or 10 cups of carrots if you're eating fresh fruits and vegetables. 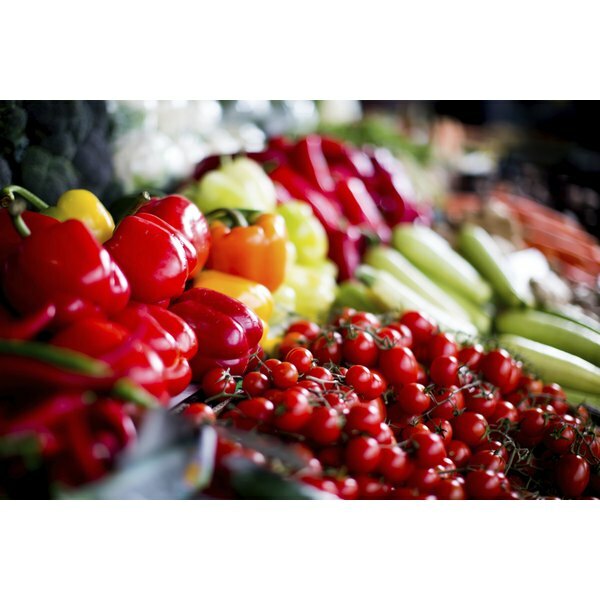 Fresh produce allows you to eat plenty of food while consuming a reasonable amount of calories -- feeling full rather than hungry means you'll stick to it, and you will see the results of your hard work. An unhealthy diet causes bloating, which works entirely against the notion of flat abs. Fruits and vegetables are sources of healthy carbohydrates that also contain plenty of fiber, which regulates your digestive system and prevents gas and bloating. According to the Health Castle website, you should eat 25 grams of fiber per day to achieve flat abs. The high water content of fruits and vegetables can also help prevent constipation, which also results in a bulging belly. Phase fruits and vegetables into your diet gradually, as you might experience some initial gas and bloating until your body has time to adjust. Replace one of the eggs in your omelet with a handful of spinach, and snack on apple slices or baby carrots. If you do have intestinal discomfort at first, try an over-the-counter gas prevention medication. Eat more leafy green vegetables than starchy vegetables like corn and peas, and choose fresh fruit over fruit juice, which loses its fiber in processing. The Centers for Disease Control and Prevention says to remember to replace the foods you already eat with fruits and vegetables -- don't just add them in. The total number of calories you eat still counts. According to the U.S. Department of Agriculture, adults should eat between 1-1/2 and 2 cups of fruit, and 2 to 3 cups of vegetables every day. Don't worry about measuring everything -- a small apple, a large orange, or a large banana all count as one cup. For grapes, lettuce and other multiple-piece options, one cup is about the size of a softball. My Pyramid: Inside the Pyramid: How Much Fruit Is Needed Daily? My Pyramid: Inside the Pyramid: How Many Vegetables are Needed Daily or Weekly?